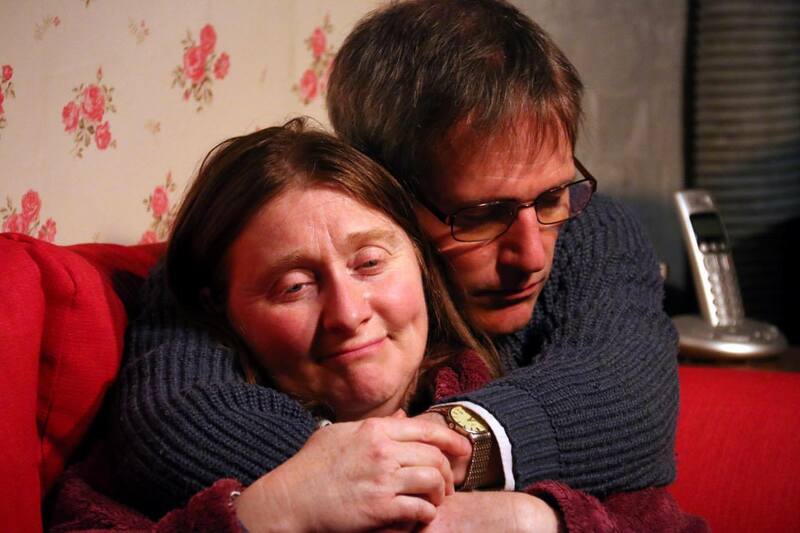 Deborah Hedges and Patrick Neylan in ‘Colder Than Here’. Like letters from HMRC, it is a certainty that we are all going to die. It is a curiously human thing to be aware and conscious of our own eventual end, and much in the way of culture and thought is devoted to the subject. Laura Wade’s Colder than Here doesn’t aspire to lofty philosophical musings on life and ‘what lies after’, but its depiction of a family dealing with and preparing for the inevitable loss of a family member is touching, human and necessarily mundane. Myra (Deborah Hedges) has terminal bone cancer. Admirably, the play does not give us a heart-wrenching scene of the prognosis delivered by a stony-faced physician, and any discussion of some miraculous recovery is swiftly dismissed. The cancer is simply a part of her character, like her good-natured grumpiness or propensity for fluffy dressing gowns, and it gives the central focus of the plot a real and relatable humanity not to have her illness be played as too tragic or dramatic. Hedges has an extraordinary talent for playing every audience member’s mother and her performance is subtle, charming and damn heart-breaking as we witness the slow onset of the various aches and pains that signal the death she is resigned to. Pragmatic planning of her funeral arrangements, ranging from taking her daughter to picnic on possible burial sites to a hilarious PowerPoint presentation of her wishes (with accompanying comedy sound effects and clipart) keep the audience on a tightrope between tragedy and warmth, tears and laughter throughout. Supporting her are the rest of the family. Patrick Neylan as emotionally guarded husband Alec was at his best injecting scathing putdowns and dry one-liners with surgical precision into the scene, though I felt his more emotional moments – while touching – did not quite reach the fullest potential, and his rant to the boiler company rep on the phone was distractingly too Basil Fawlty. Jenna (Nomi Bailey) was dysfunctional and rebellious to start but she underwent a wonderful journey to come to terms with her own insecurities, eventually helping both her mum and seemingly stronger sister with emotional support and was very competent in the role. Ami Whittaker Standing contrasted beautifully with Bailey as the favoured, more successful and assured daughter Harriet. Easily the best performance I have seen from her at BLT, cracks in her strong façade faced with Jenna’s anguish were subtly conveyed, and the scene of her opening up about her own doubts to her sister were heartbreakingly performed. Colder than Here was Phil Cairns’ directorial debut, and it seems to have become a function of the In the Bar format to ‘test-run’ directors before they graduate to the main stage. For the first time though, I felt that this show not only deserved to, but also would have benefited from being in the main house. The bar seemed too constrained a space for the actors to really open up in terms of movement, and all too often they had to manoeuvre awkwardly around the pillars and each other. Several audience members had to stand in their seats to get the full effect of the cardboard coffin in the middle of the living room floor, which really weakened the scene, and effect of the prop. However, the show itself was a triumph, a sensitively handled and genuinely touching comedy about death. Cairns’ direction was well thought out, personal, and frequent use of dangerously long pauses in scenes never impeded the flow of the story or dialogue. Every member of the cast brought strong performances and superbly realised characters to the Bar, and the audience were shedding genuine tears of both laughter and sadness throughout.